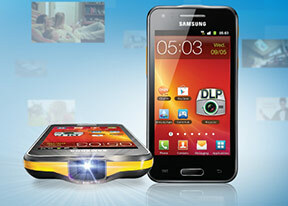 The retail package that the Samsung I8530 Galaxy Beam comes in had a couple of nice surprises in store. The first thing is a stand that lets you place the Beam on a table or bedside cabinet. Sadly, the angle it's propped up at makes it useless for video watching, unless the ceiling is your screen. A cool side feature of the said stand though is that it's able to charge the spare battery, which is also supplied in the retail package. With the power-hungry projector at hand, the Galaxy Beam is likely to make good use of the extra juice. The other items in the bundle are a pair of headphones with some spare earbuds, a charger and a microUSB data cable. Those last three items are usually all you get with mid-range and upper mid-range devices, so it's really great treatment you are getting here. The I8530 Samsung Galaxy Beam is genuinely trying to improve on the ergonomics its predecessor. Not that you should expect a phone with a built-in projector to be ultra-compact. At 124 x 64.2 x 12.5 the new Beam is slightly taller but a good 2.4 mm slimmer and more than 10g lighter. The I8530 Galaxy Beam has a bigger screen than the original, but the resolution stays the same and it's a garden variety LCD and not a Super AMOLED. Place the Samsung I8530 Galaxy Beam down on a table and you'll hardly be able to tell it apart from a Samsung Galaxy R or an S Advance. A side view exposes its thicker waistline which takes away some of the device's appeal. The smartphone has an all plastic construction but, considering the weight of 145g, other materials were probably never really an option. The plastic used is of pretty decent quality, so it's not really all bad. There's a secondary camera above the display, as well as proximity and ambient light sensors. Moving below the display you'll find the usual hardware Home button with two capacitive controls on the sides: Menu and Back. The projector lens is placed at the top, deeply inset under a big piece of protective glass. It stays out of the way most of the time and only slightly protrudes at the back. More than once during our test, it felt the lens would've made sense on one of the sides of the smartphone, given the projector's default orientation is landscape but more on that later. The projector can be used as a flashlight as well, and it's quite suited to the job too, if you don't mind the relatively small lit surface. Its placement certainly feels more natural than a LED on the back. On the right side of the handset, closest to the top, is the dedicated projector key. A little further down is the usual power/lock button. We did mix those two up at first, hitting the projector button instead of the unlock button. However, it doesn't take too long to get used to the arrangement. The last thing to note on the right is a hot-swappable microSD card slot hidden under a small lid. The volume rocker is on the left, where we were surprised to find an external SIM slot as well. It's quite out of the ordinary for the SIM compartment to be placed on the outside but the phone's inner body is almost entirely sealed. It's actually bolted to the front, making the smartphone more dust-resistant than usual. The bottom of the Galaxy Beam features the mouthpiece and a microUSB port for charging and data connections. The battery cover of the Galaxy Beam is entirely made of plastic but benefits from a nice anti-slip rubbery finish. There's a slight bulge at the top to accommodate the projector. The 5 MP camera lens is centrally placed right below that bulge, with a single LED flash at its side. In the bottom left corner is the loudspeaker grille. Removing the back panel reveals the 2,000 mAh Li-Ion battery. It is said to last for up to 760h of stand-by or 9h 40 min of talk time on a 3G network . 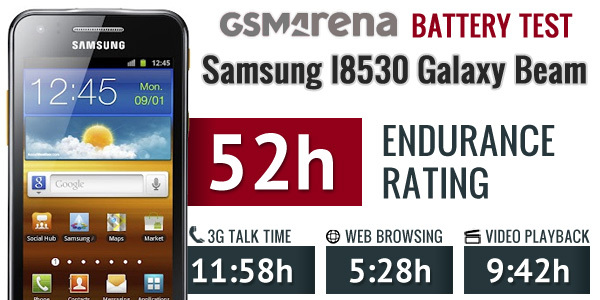 If you stick to 2G you get the same stand-by endurance but the maximum achievable talk time jumps to up to 20h. We ran the Beam through our traditional battery test and came up with a pretty impressive overall endurance rating of 52h. For more info on our battery testing process go here, while the full battery test on the Galaxy Beam can be found here.